They've really had some great stuff recently at Time.com Picture of the Day/Pictures of the Week after a long period of nothing. 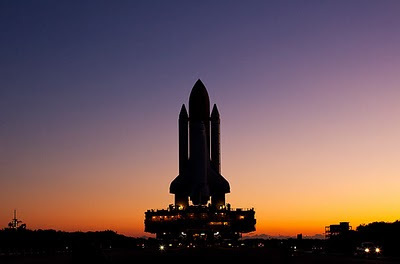 Here's a beautiful shot of the Space Shuttle. It's hard to imagine that these magnificent machines will be retiring soon. A bit like the Concord supersonic airplane.....nothing has been built to replace it. Sad that we don't seem to evolve much these days (but of course that's silly of me...after all look at that gorgeous 2,600 ft high new tallest building, Burj Khalafi. See my previous posts a few days ago). Space Shuttle Endeavour rolls to launch pad 39-a at the Kennedy Space Center in Cape Canaveral, Florida.